Midnight Kitchen is a non-profit, worker and volunteer-run collective that operates out of tio’tia:ke (unceded kanien’kehá:ka territory) dedicated to providing accessible food to as many people as possible. We aim to empower individuals and communities by providing a working alternative to current capitalist, profit-driven systems of food production and distribution. We oppose privatization, corporatization and other systemic processes that both cause and perpetuate marginalization of certain people. 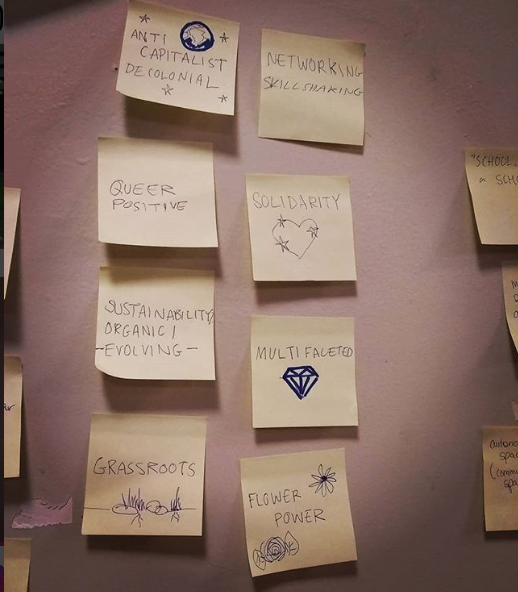 We will provide popular education on issues of social, environmental, and food (in)justice, both inside and outside the collective, and provide space for the exchange of ideas within the community. We oppose both violent, status-quo food systems as well as green-washed, individualized “lifestylist” approaches that direct attention away from the systemic causes of poverty, environmental destruction, and lack of access to food. By taking initiative to produce and distribute food in our own communities, we act in the pursuit of social and environmental justice and will support others who share these goals. Our approach to food justice is grounded in anti-oppression with a mandate to center marginalized humans.